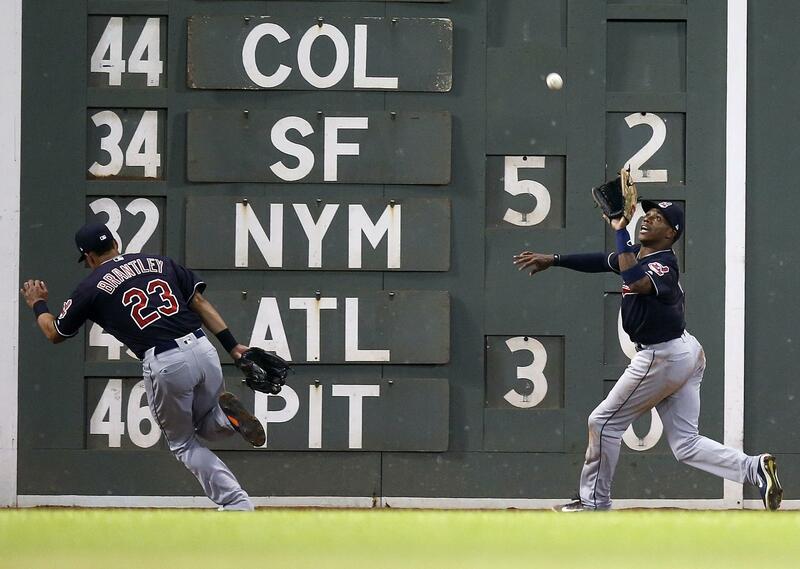 UPDATED: Tue., Aug. 21, 2018, 11:21 p.m.
BOSTON – Center fielder Greg Allen made two superb catches to help fellow rookie Shane Bieber hold down Boston, and the Cleveland Indians beat the Red Sox 6-3 Tuesday night in a matchup of A.L. division leaders. Allen doubled, singled and drove in a run. But he made the biggest impact with his glove. First, Allen raced back and slammed into the padded wall to take away an extra-base hit from Xander Bogaerts leading off the fifth inning. Then, with the Red Sox trying to rally in the seventh, Mitch Moreland hit a long drive toward the dirt triangle in deep center. Allen slid to a stop as he caught the ball over his shoulder – it was a sacrifice fly and finished Bieber, but thwarted Boston’s momentum. Bieber (7-2) took a shutout in the seventh, allowing three runs and five hits in 6 1/3 innings. YANKEES 2, MARLINS 1, 12 INNINGS: At Miami, Giancarlo Stanton had two hits in his homecoming but closer Aroldis Chapman left the game accompanied by a trainer as New York beat Miami in 12 innings. After Yankees backup catcher Kyle Higashioka raced home on a sacrifice fly in the 12th, Chapman came on trying for his 32nd save, but he departed with none out when his troublesome knee flared up. Stanton, playing in Miami for the first time since he was traded after eight seasons with the Marlins, singled in the first and missed a homer by a few feet when he doubled off the left field wall in the fifth. Higashioka led off the 12th with a single against Javy Guerra (1-1). After the Yanks loaded the bases, Miguel Andujar hit a sacrifice fly to left field, with Higashioka sliding home ahead of the throw. After Chapman departed following a walk to Isaac Galloway and wild 96 mph fastball on the next pitch, Tommy Kahnle came on to earn his first save since 2016. Higashioka threw out Galloway trying to steal second to end the game. A.J. Cole (3-0) pitched out of a bases-loaded jam in the 11th. BRAVES 6, PIRATES 1: At Pittsburgh, Dansby Swanson had two homers and four RBIs, Kevin Gausman breezed through eight innings to lead Atlanta past Pittsburgh. Swanson’s first homer gave the Braves a 2-0 lead in the fifth before he sent another two-run shot into nearly the same spot in the left field bleachers, extending the lead to 5-0 in the seventh. Kurt Suzuki doubled down the left-field line, scoring Ozzie Albies from first for the third run. Tyler Flowers scored on a wild pitch in the ninth to make it 6-0. Gausman (8-9) gave up four hits with five strikeouts and two walks, helping the NL East-leading Braves take the first two legs of the three-game series. Ivan Nova (7-8) allowed Swanson’s first home run after retiring his initial 10 batters, including the first nine on 29 pitches. Ender Inciarte singled to center for Atlanta’s first hit with one out in the fourth. RAYS 4, ROYALS 1: At St. Petersburg, Blake Snell helped Tampa Bay match a team record with 27 consecutive shutout innings and the Rays beat Kansas City. The scoreless stretch ended when Snell (15-5) allowed a fifth-inning solo homer to Ryan O’Hearn. Snell struck out 11 and gave up four hits in six innings. The left-hander has 13 straight home starts of allowing one earned run or fewer, which is longest stretch in the majors since 1913, according to the Elias Sports Bureau. O’Hearn has five homers in 14 career games for the Royals, who dropped to 50 games (38-88) under .500. Tampa Bay’s Tommy Pham had three hits, an RBI and a walk but left in the eighth after he appeared to hurt his right hand/wrist area diving back to first base on a pick-off attempt. Willy Adames had three hits and put the Rays up 1-0 on a homer off an overhanging catwalk in the second. TIGERS 2, CUBS 1: At Detroit, Jordan Zimmermann pitched six effective innings, Victor Martinez had three hits and Detroit beat slumping Chicago. Zimmermann (6-5) allowed seven hits, struck out five and walked one, continuing the Cubs’ misery. Drew VerHagen, Joe Jimenez and Shane Greene combined for three innings of one-hit relief, closing out the Tigers’ second win in seven games. Greene got his 27th save in 30 chances. The N.L. Central-leading Cubs were held to one run via homer for the fifth straight game, dropping the last three in the offensive slide. This time, Anthony Rizzo led off the sixth with his 19th homer, falling to his knees as he drove Zimmermann’s first pitch over the wall in right. But that was it once again for Chicago. Help could be on the way after the Cubs acquired Daniel Murphy in a trade with Washington before the game. Detroit got both of its runs in the first inning against Kyle Hendricks (9-10) on Nicholas Castellanos’ RBI grounder and Martinez’s two-out RBI single. Hendricks gave up 10 hits and walked one in seven innings. BLUE JAYS 8, ORIOLES 2: At Toronto, Justin Smoak and Kendrys Morales hit back-to-back home runs, Aledmys Diaz and Billy McKinney also connected, and Toronto improved to 9-0 at home against struggling Baltimore. Blue Jays right-hander Sam Gaviglio (3-6) pitched seven innings to snap a 15-start winless streak, earning his first victory since May 25 at Philadelphia. Gaviglio allowed two runs and six hits. Smoak and Morales chased right-hander Dylan Bundy (7-12) with solo blasts two pitches apart in the fifth. Smoak’s homer was his team-high 19th. Morales, who homered twice in Monday’s 5-3 win, has hit four home runs in his past three games, giving him 17 on the season. One out later, McKinney took Ryan Meisinger deep for his first career homer, giving the Blue Jays their first three-homer inning since Aug. 23, 2017 against Tampa Bay. METS 6, GIANTS 3: At New York, Rookie Jeff McNeil went 4 for 4 and hit a go-ahead double with two outs in the eighth inning that lifted New York past San Francisco. McNeil equaled his career high by getting four hits for the second time since making his major league debut last month. Michael Conforto homered and drove in four runs. Evan Longoria hit a two-run homer for the Giants, who fell to 3-5 on an 11-game road trip – they’ve scored two runs or fewer five times. With the score tied at 2, Jose Reyes led off the Mets eighth with a triple off the center field fence. McNeil delivered two outs later against Tony Watson (4-5). Conforto added a three-run homer after the Giants intentionally walked Wilmer Flores. Corey Oswalt (3-2) pitched three scoreless innings. Seth Lugo gave up a run in the ninth. PADRES 4, ROCKIES 3: At Denver, Eric Hosmer and Austin Hedges homered off Tyler Anderson and San Diego Padres cooled off surging Colorado. The Rockies arrived home after a 5-1 trip that included a four-game sweep of Atlanta. The last-place Padres are 6-7 against the Rockies this season. Hedges had the big blow with a solo homer in the sixth, giving San Diego a 4-3 lead. Padres left-hander Robbie Erlin (3-3) allowed three runs over five innings. He made five scoreless relief appearances against the Rockies earlier this season. Craig Stammen escaped a bases-loaded jam in the eighth by striking out Trevor Story and getting Carlos Gonzalez to ground out to second baseman Christian Villanueva, who made a nifty sliding play. Kirby Yates pitched the ninth for his fifth save, with Chris Iannetta flying out to deep left to end the game. Anderson (6-6) had pinpoint accuracy over 6 1/3 innings – 74 of his 99 pitches were strikes – except for two misplaced cutters to Hosmer and Hedges. CARDINALS 5, DODGERS 2: At Los Angeles, Yadier Molina and Marcell Ozuna slugged two-run homers, and St. Louis improved to a major league-best 16-4 in August. The Cardinals have homered in 14 straight games. They won the opener 5-3 on consecutive ninth-inning homers by Jedd Gyorko and Matt Carpenter. The victory clinched their eighth consecutive series, equaling their longest streak since April 10-May 7, 2015. St. Louis climbed to 2 1/2 games behind the N.L. Central-leading Cubs. Jose Martinez tied it with an RBI single in the third. Molina followed with a two-run shot to right center to make it 3-1, snapping an 0-for-17 skid and leaving him one hit shy of his 11th straight season with 100 or more. Ozuna hit a two-run homer in the seventh that extended the Cardinals’ lead to 5-1. The Dodgers’ runs came in the second when Daniel Poncedeleon hit Yasiel Puig with the bases loaded and in the seventh on Manny Machado’s 29th homer. Luke Weaver (7-11) got the victory, allowing one run and three hits in 2 1/3 innings of relief. Bud Norris pitched the ninth for his 26th save. Hyun-Jin Ryu (3-1) gave up three runs and four hits in four innings, struck out four and walked one. ASTROS 3, MARINERS 2: At Seattle, Josh Reddick homered to give Houston the lead and the Astros held on to beat Seattle. Reddick’s tiebreaking homer in the fourth inning put the Astros ahead 2-1, and Yuli Gurriel added an RBI single in the sixth for a two-run lead. Seattle pulled to 3-2 in the eighth inning on Ben Gamel’s RBI single to right field, but stranded the tying run at third base after pinch hitter Nelson Cruz and Dee Gordon struck out against Roberto Osuna to end the inning. Hector Rondon earned his 14th save with a spotless ninth inning as Houston snapped a five-game skid against Seattle and remained tied with Oakland atop the A.L. West standings. Rookie left-hander Framber Valdez (1-0), who came up from Triple-A Fresno earlier in the day, won in his big-league debut, tossing four-plus innings of one-run ball in relief of Brad Peacock. Houston took a 1-0 lead on Carlos Correa’s sacrifice fly off Ross Detwiler (0-1) in the third inning. The Mariners tied it when Mitch Haniger scored on Mat Stassi’s passed ball after Kyle Seager struck out in the third. DIAMONDBACKS 5, ANGELS 4: At Phoenix, Angels pitcher Cam Bedrosian threw wildly after fielding a sacrifice bunt attempt in the bottom of the ninth inning, allowing Jon Jay to score and give Arizona the win. Jay was hit by a pitch to start the inning, then moved to second on John Ryan Murphy’s sacrifice attempt that turned into a hit. A.J. Pollock then laid down another sacrifice try, and Bedrosian (5-3) attempted to force out Jay at third. David Peralta drove in three runs and came a triple short of the cycle for Arizona. ATHLETICS 6, RANGERS 0: At Oakland, California, Khris Davis homered for the second straight night to move him two away from a third straight 40-homer season, backing Brett Anderson’s gem as Oakland beat Texas. Davis hit a two-run shot in the seventh for No. 38 of 2018, his fourth home run in three games and ninth in 15. Anderson (3-3) struck out six and walked one over seven impressive innings. He earned his first victory in five starts since beating the Rangers on July 23, coming off three straight no-decisions. He didn’t allow a hit until Shin-Soo Choo’s leadoff double in the fourth – the only hit the lefty surrendered – but the Rangers couldn’t capitalize. A’s relievers Jeurys Familia and Lou Trivino each pitched an inning to finish the two-hitter in 2 hours, 26 minutes, Oakland’s second straight shutout and 12th in all. Rangers rookie right-hander Ariel Jurado (2-3) gave up four runs and 10 hits in 5 2/3 innings. TWINS 5, WHITE SOX 2: At Chicago, Michael Kopech’s anticipated debut for the Chicago White Sox was cut short by a rain delay, and Eddie Rosario led Minnesota to the win. The 22-year-old Kopech, one of baseball’s top pitching prospects, struck out four in two scoreless innings before a 52-minute rain delay. Luis Avilan came in for the White Sox when the game resumed. NATIONALS 10, PHILLIES 4: At Washington, Andrew Stevenson and Wilmer Difo hit back-to-back home runs in a five-run sixth inning and Washington rallied for the win hours after the Nationals traded Daniel Murphy and Matt Adams. Stevenson, who was called up from Triple-A Syracuse earlier in the day, tied the game with his first career homer, a two-run pinch-hit shot to center. Difo – starting at second base after Murphy was dealt to the Chicago Cubs – followed with a shot to right off Victor Arano (1-2). Ryan Zimmerman hit his 11th homer of the season and doubled for Washington and Matt Wieters drove in three runs with a pair of singles. Jimmy Cordero (1-0) pitched one inning for the win. Philadelphia’s Roman Quinn hit his first career home run in a game that was delayed 1:42 by rain in the third inning. Quinn struck out with the bases loaded and two outs in the eighth against Wander Suero. REDS 9, BREWERS 7: At Milwaukee, Scooter Gennett burned his former team in a big way, hittting a tiebreaking solo homer with two out in the ninth as Cincinnati prevented Milwaukee from gaining ground in the National League playoff race. Gennett drove a first-pitch slider from Dan Jennings (4-5) into the first row of the right-field bleachers. Cincinnati added an insurance run on Mason Williams’ RBI double against Corey Knebel. Milwaukee had tied the game in the eighth on Jonathan Schoop’s first career pinch-hit homer and Ryan Braun’s RBI double. The Brewers remained three games back of the NL Central-leading Chicago Cubs, who lost 2-1 at Detroit. Raisel Iglesias (2-1), who yielded Braun’s tying double, escaped a ham in the ninth for the win. The Brewers put two runners on with two out, but Keon Broxton struck out swinging. Published: Aug. 21, 2018, 11:21 p.m. Updated: Aug. 21, 2018, 11:21 p.m.